With the assistance of our highly qualified and expert professionals, we have been accomplishing the specific demand of Stepwell Recharge Pit to the customers. Highly recognized for their high filtration, easy maintenance and maximum expenditure, these rechargeable pits are broadly demanded by our clients. This Modular Step Well is highly used in recharging systems for matter filtration. Moreover, we offer these pits as per the requirement of the clients at pocket friendly prices. 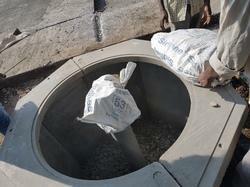 Modular Recharg pit¿¿is one of the type of 'Furaat', Which is advisable for roof top Rain Water Harvesting. For Surface run off rain water harvesting, HFM (Horizontal Filtration Module and SFM (Sand Filtration Module) together is to be used. And for roof top rain water harvesting SFM alone isenough. High efficiencySturdy ConstructionSimple installation¿¿is one of the type of 'Furaat', Which is advisable for roof top Rain Water Harvesting. Recharde pit is one of the type of 'Furaat', Which is advisable for roof top Rain Water Harvesting. RCC Recharge Pitis one of the type of 'Furaat', Which is advisable for roof top Rain Water Harvesting.